While I don't force my children to clear every speck of food off of their plate every time we sit down for a meal, I do acknowledge that I have issues with throwing away food. Why are you eating that if you're not hungry? My husband will ask me incredulously. Because otherwise it's wasting it! Which is why I feel a little piece of me cry on the inside each and every time I open our refrigerator and find items that were forgotten, pushed to the back or simply ignored, and have now spoiled. I'm sorry, rotten celery! I didn't mean for this to happen and you to end up so slimy! 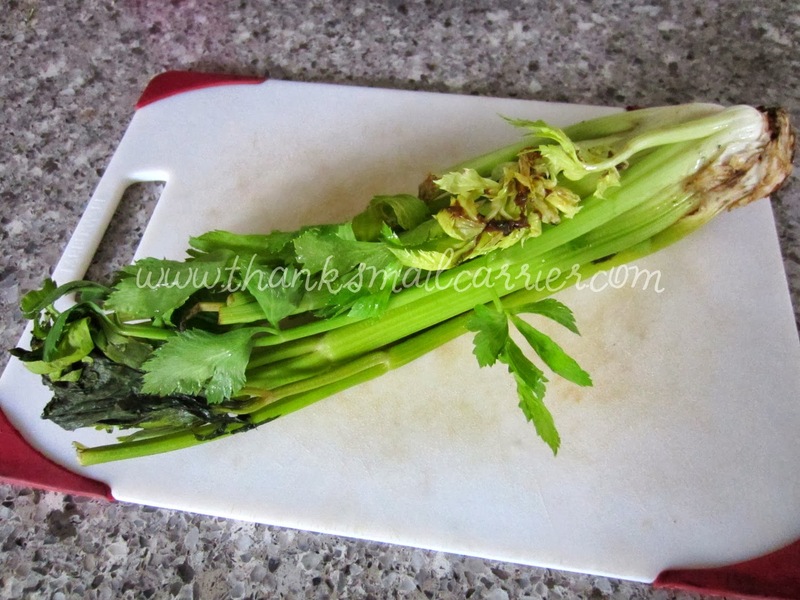 Fortunately, for anyone who loves produce, frequently attends farmers markets or simply wants to save money and buy food in bulk, there is a fast and easy way to keep food longer in the refrigerator, freezer and pantry. Why risk your food getting thrown away when you can keep it fresh up to five times longer than traditional storage methods thanks to FoodSaver Home Vacuum Sealers? 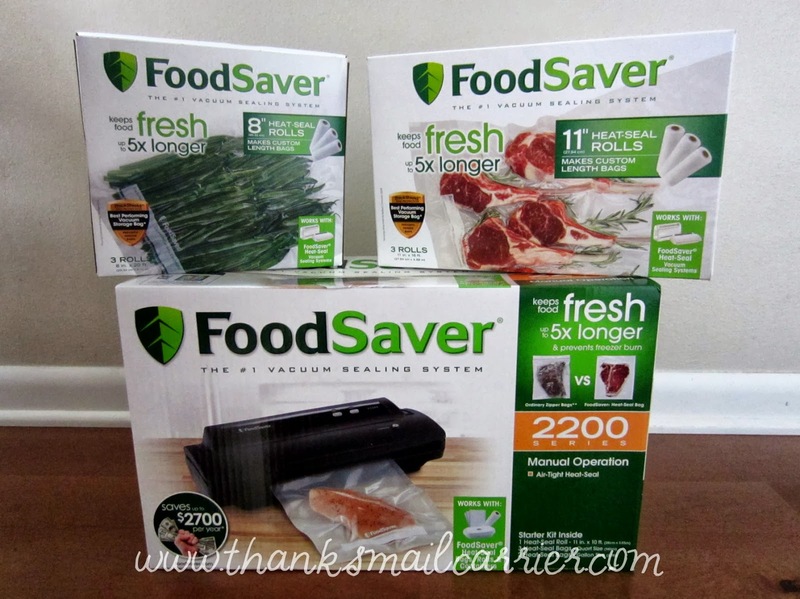 As America's #1 Selling Brand of Home Vacuum Packaging Systems for more than 20 years, FoodSaver Brand Products have helped millions of households keep food fresh longer by simply removing the air and sealing the package. Because bacteria needs oxygen in order to multiply and grow, once you've removed the oxygen, you've essentially cut off the lifeline for the mold. (You're impressed with my scientific knowledge, aren't you?) So, thanks to FoodSaver, your fresh vegetables stay that way longer, your portioned meats are waiting for you in the freezer and your favorite crackers aren't immediately stale. In fact, FoodSaver states that by eliminating the average cost of wasted food ($600) and buying in bulk and on sale ($2,084), your family can save up to $2,700 a year! Who doesn't want that extra cash in their pocket? Don't believe them? FoodSaver has created the handy widget below that features a savings calculator, a recipes page and helpful resources for purchasing and saving your fresh foods. Try it out and see just how much you could be saving! 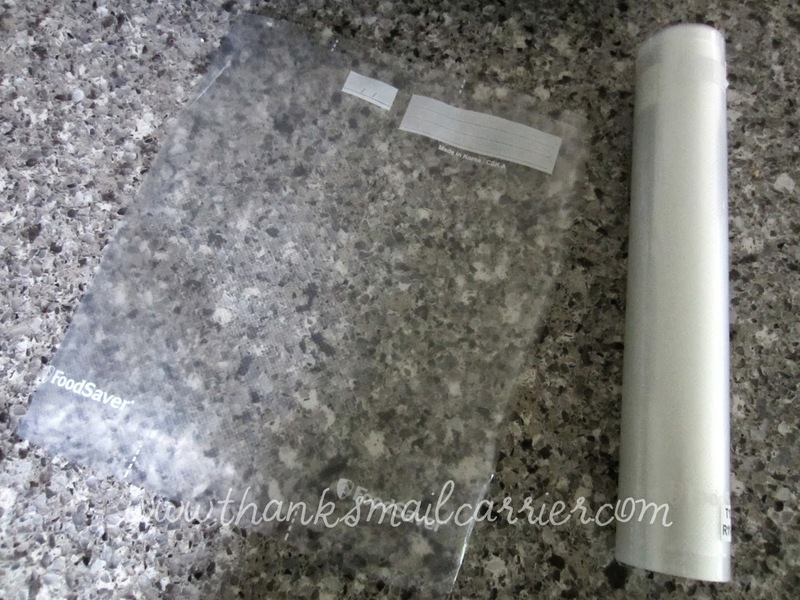 I have long been intrigued by the idea of sealing my food up in these air-tight packages and keeping it fresh longer, so when the FoodSaver V2244 Vacuum Sealer arrived, it was time to put it to use in my kitchen to see the results. Right out of the box and I found that there wasn't much else to do besides plug it in before my Vacuum Sealer was ready for use. This system's compact design makes it perfect for any kitchen and, after glancing over the easy directions, I was happy to see that there truly wasn't much to know or learn before just about anyone could get started. Once plugged in, it's time to seal or vacuum. 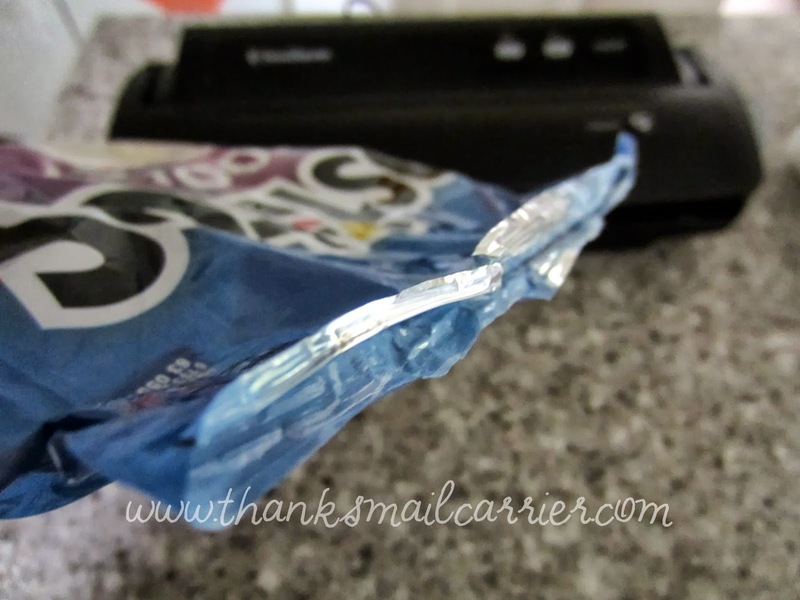 Using the Seal button on its own has proved wonderful for simply re-closing any Mylar bags (e.g. potato chip bags) after opening them. Just place the open edges together on the sealing strip, close the top and push the latch down until it locks. After one press of the Seal button, you just step back and wait for the light to turn off (5 or 10 seconds, max) and then open the lid to find that your bag is back to being closed airtight once again. How cool is that? No more discovering your chips are stale because the bag came unfolded in the pantry, now they're always going to be fresh and tasty! 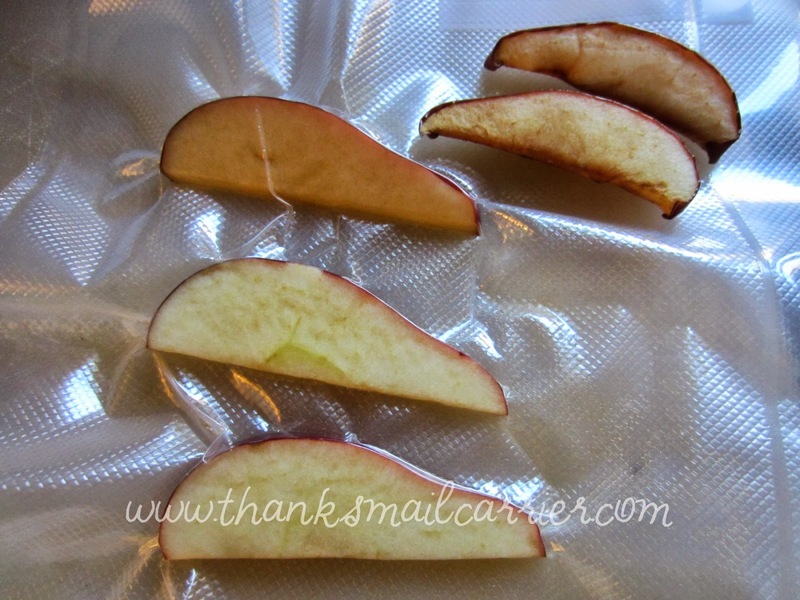 However, what a vacuum sealer is truly known for is vacuum sealing, right? This has proved to be just as easy! Either use a FoodSaver bag, which come in a variety of sizes such as quart, pint or gallon, or create your own bag from the FoodSaver Heat-Seal Rolls. I love how easy it is to simply unroll as much as you need (you want your bag to have approximately 3" of space around the food inside), cut it from the roll, and then seal one end closed. Voilà! Instant bag! ...and close and lock the lid. 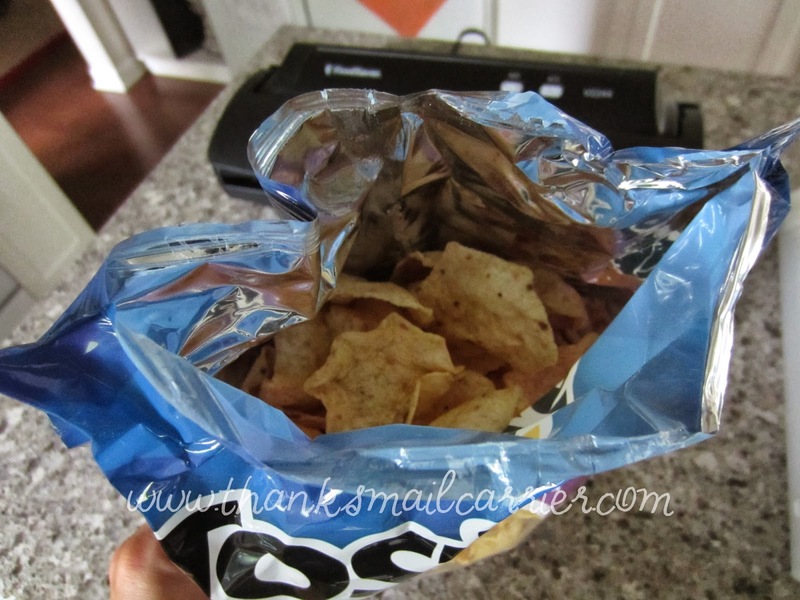 Then, upon pressing the Vacuum & Seal button, watch in amazement as all of the air is quickly pulled from the bag and it forms tightly to your items inside (you also have the option of pressing the Seal button to stop the vacuuming in case your item inside might get crushed, such as chips or crackers). At the end of 10-15 seconds, the Vacuum & Seal button turns off and your foods are tightly sealed in their air-free compartment. Perfect for keeping things fresh in the refrigerator or tossing in the freezer, as they are proven to prevent freezer burn. ...and, after a day or two, my FoodSaver apples and my "open air" apples definitely looked a bit different. There was no doubt which had been exposed to the air and which hadn't! As well as looking brown, the apples left out were completely soft and mushy. Eeew! 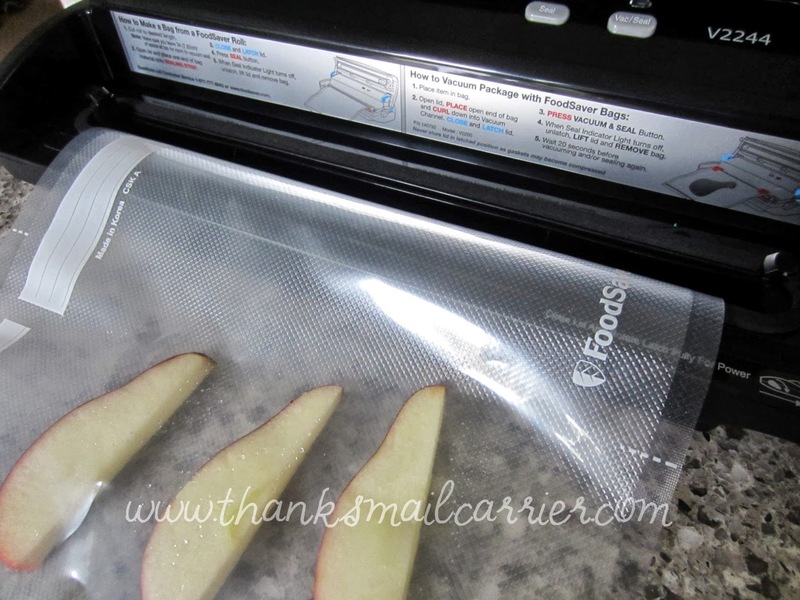 All in all, I've been extremely impressed with the way that this V2244 FoodSaver Vacuum Sealer is so very easy to use, works in seconds, and is completely silent. I had assumed that it would have some sort of motor or whirring sound that went along with it, but it doesn't make a peep! Now, no matter if I'm saving extra vegetables in the freezer for a later meal, have leftovers whose life I want to extend, or just want to buy the jumbo package at the store, there is no worry that items will spoil, rot or end up freezer burned beyond recognition. I'm looking forward to using this great machine for the rest of the fresh fall produce that we have coming our way and long into the future seasons to cut way down on the amount of food that gets wasted around here. 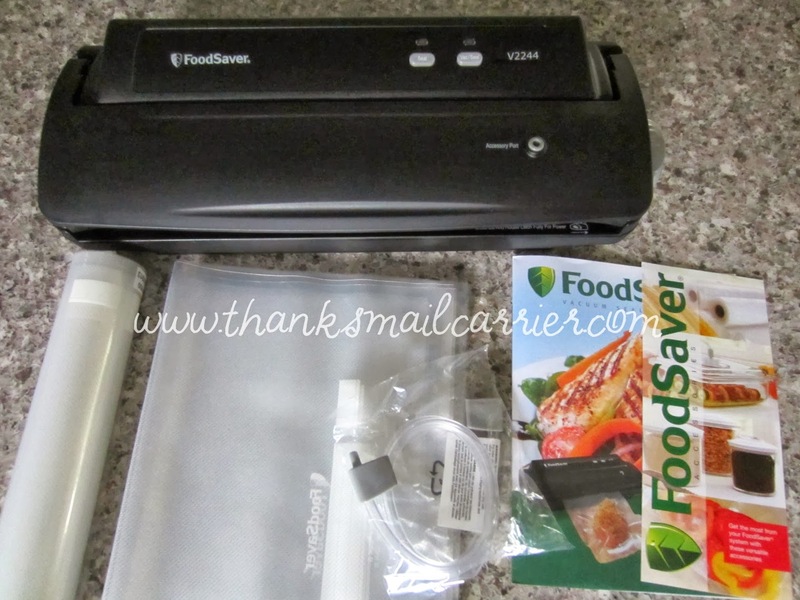 Retailing anywhere between $79.99 and $449.99, you can find out much more about all of the innovative FoodSaver Vacuum Sealers by visiting FoodSaver.com and connecting with them on Facebook. Other than the V2244 Vacuum Sealer and two boxes of Heat-Seal Rolls that I was sent in order to facilitate my review, I was not compensated or enticed to do this post in any way. This review is solely my honest opinion about this product. We have one & love it, I use it daily! I am so glad I read your review. 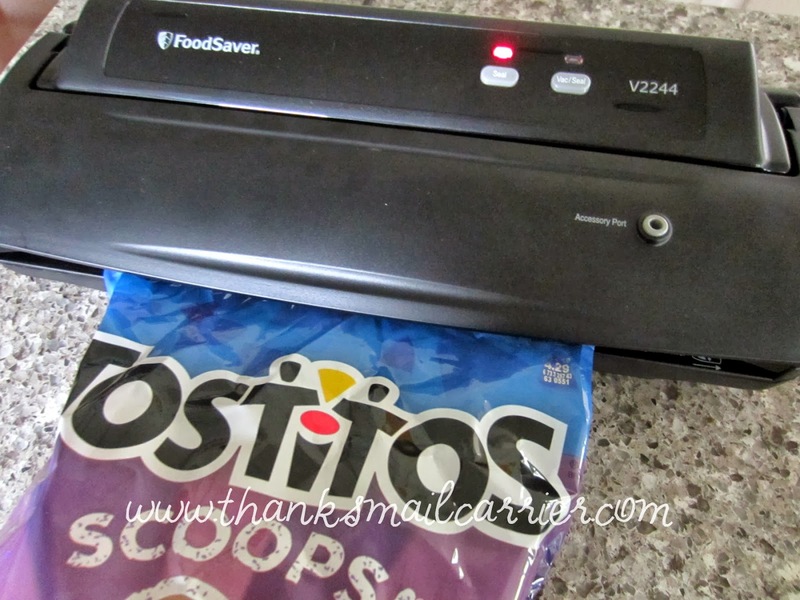 I am a goof...we have one of these & never thought to use it to re-seal my chip bags...duh! Wow, thank you gobs!! I also feel terrible when having to discard food. It always makes me feel like there's someone out there who is hungry and I'm being wasteful. I would love so much to have this product in my home. My sister has one and is extremely satisfied! I have the oldest model of this and it is still a good product. However I have seen the new one in use and it is so much nicer. I haven't used mine much because it is not as easy to use but I really need to or get hubby to buy me the newest model. Okay, you've totally sold me. I need one of these, asap! I live alone and this would come in very handy when I get a large package of something and want to save it in single meals. I didn't know it could close chip bags - I'd really use that feature. I'm a bit amazed at how many different foods can have a longer life. Chips I wouldn't have guessed. Produce is expensive and always an issue as to best preserving what hasn't been used. Very impressive numbers on saving on food bills by not wasting and buying in bulk. This looks like a handy product. I, too, will eat something simply because I don't want it to go to waste. Like the package seal option, too. I am tired of having to throw out food because they turn 'ugly'. I may have to go ahead and buy a food saver. I hate having to throw away food because it isn't fresh anymore. 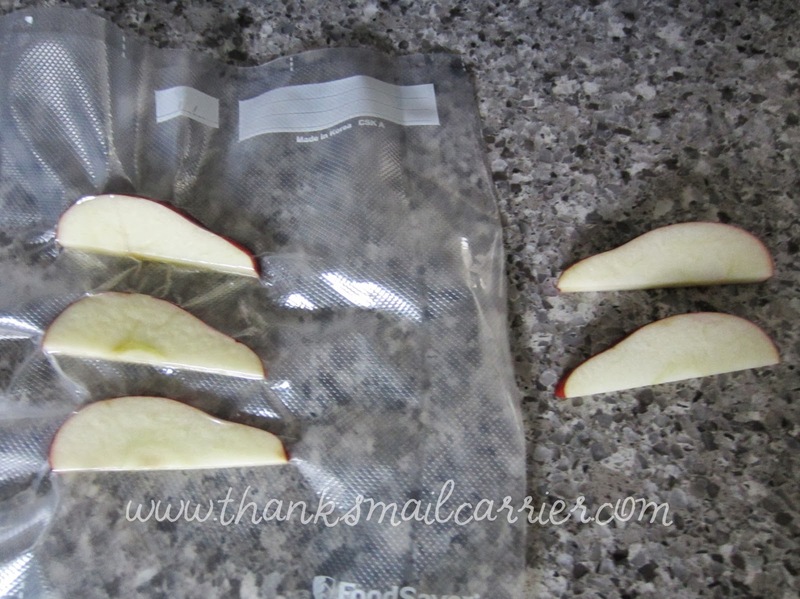 I love this idea of keeping food fresh for longer!